There is a new study in the latest issue of the journal Research in Autism Spectrum Disorders on a correlation between autism, brain volume and aggression. 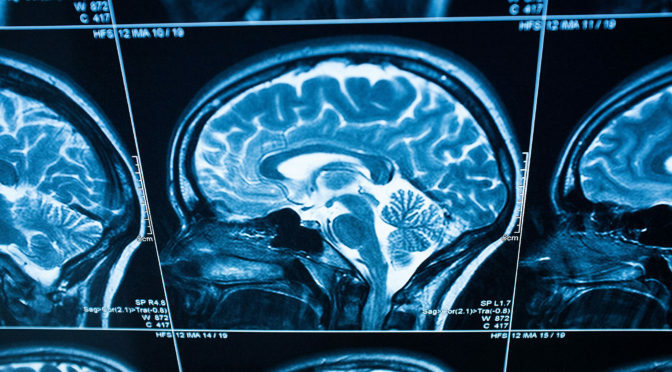 The team of researchers from Brigham Young University studied structural MRI data from the brains of 45 Autistic boys and 18 non-autistic boys to see if the brains did similar things or different things in the presence of “aggressive behavior.” Autistics who had been reported as exhibiting so-called “problematic aggression” had smaller brain stems and did not show the non-autistic tendency of structural differences in the brain structures linked to emotions and behavior. The short answer to that is “no.” The long answer is yes, but not the way that quote seems to imply. The researchers are looking in the wrong direction. It’s like they’re trying to describe a train by looking at railroad tracks. Sure, tracks will tell you a lot about the trains that use them, but if you’ve never seen a train before, you could easily make the mistake of thinking that the tracks are all there is. “Autism makes it hard to communicate.” This is how Kreed, an Autistic teen, explains his aggressive behavior to his mother. Kreed’s words are so much more valuable than the measurement of a brain stem. A brain stem correlation shows what is happening but Kreed’s answer can explain why it is happening. when they listen while Autistic people explain things, will begin to understand why the train passes from town to town. If I try to get my needs met, my aggressive behavior is dismissed as a mere symptom to be treated. If an Autistic teen who doesn’t speak was uncomfortable and a therapist tryed to force that teen to sit at a table and point to the color blue again and again and forcibly return him to my seat when he tries to get up, what can he do? He has no speech with which to reason with the therapist and he is being forcibly detained. Of course he will fight to get their most important needs met. There’s another thing the researchers are missing: so much Autistic behavior that is labeled “aggressive” is not an expression of aggression at all. South, another co-author of the study, describes an Autistic child who pulled her mother’s hair during times of stress as an example of aggressive behavior. While there is a possibility that the hair pulling was an expression of anger or aggression, it’s far more likely that it satisfied a sensory need that helped the child to cope with and regulate her stress. When studying the things that Autistic people do and say, it’s so important to avoid making assumptions. When anthropologists study other cultures, they are trained to observe carefully and remember that, for example, washing a face doesn’t always mean a person is trying to clean their skin from dirt. Many groups of people wash their face, hands, or body for religious reasons. When studying Autistics, researchers need to take the same care. While autism is not a culture in the anthropological sense of a shared set of customs that are handed down from generation to generation within a community, approaching autism and Autistic people as a people with a very different culture from non-autistic people generates much more useful insights. The researchers conducted their study because they did not assume that the same brain structures would be involved in Autistic actions as are involved in non-autistic actions. Why, did they choose to approach the topic of “aggression” as if pulling someone’s hair always means the same thing all the time, in every situation? Why do we need to scan children’s brains to decide who will be listened to and and who will be ? If my brain scan says that my brain stem is large enough, will I be blamed and judged for my inability to regulate my emotions and cope with stress while someone else whose brain stem had one cc less volume will be treated with compassion? Here’s a radical idea: Why don’t we treat all with compassion? Childhood is difficult and learning to self-regulate is a challenge for everyone at some point in their development. Why don’t we value treating everyone with compassion and respect? Why don’t we value slowing down and paying attention to one another? Why don’t we value stopping what’s happening when people show signs of distress and moving forward from that point with caution and caring? Measuring brain scans and pathologizing Autistics’ attempts to get their needs met is easier. Respecting the autonomy and dignity of others doesn’t make for a crisp CV the way correlations from structural MRI data does. Reducing human beings to strings of data gets you publishable results, but it doesn’t do anything to help those people who are being treated like robots, filled to the brim with whats and emptied of all their whys. Thank you, thank you, thank you. I am a mother of children on the spectrum and someone who works in occupational therapy. I completely agree with what you are saying. I think they have missed a very important matter in this study. London taxi drivers develop the part of the brain that deals with direction to a far greater extent than most people. resulting in an increased rapid and accurate response to activity relating to finding their way in London. This happens over time and is related to use. If a person is exposed to trauma is it possible that the part of the brain which responds to trauma is increased, thereby increasing the response to trauma? Not only is it possible, there are several studies out there showing changes to brain structures, particularly in the amygdala, as a response to trauma. This is one reason why I tell people that restructuring the environment to avoid triggering meltdowns is not coddling an autistic person. It is a reasonable and advisable protective measure. The ongoing and prolonged stress of multiple meltdowns cause structural and functional changes in the brain that are detrimental to happy and productive living. You make an excellent point. Thank you for sharing it. Yes. It’s pointless to try to correlate aggression with something biologically inherent in autism if you haven’t assured that someone’s communication needs are being met. I’m always observing the symmetry or lack of symmetry in my environment. My brain likes symmetry. Sometimes, I create that symmetry myself…that’s stimming. Meltdowns happen when that sensory symmetry is unexpectedly disturbed, like a sudden change in routine without warning or too much stimuli or multiple “respond now” prompts (like the phone and doorbell ringing) happening simultaneously. I know most of what triggers this asymmetry for me, but I can’t avoid all of those triggers all the time. People can help me avoid the ones that are avoidable by accommodating my need for symmetry to the best of their ability.